"Calgary, Calgary, this is Camp 4. It was, beyond a doubt, my most glorious day." Above All Else: The Everest Dream documents the journey of two friends, Jamie Clarke and Alan Hobson, as they make their third attempt at scaling Everest, the tallest mountain on the planet at 29,028 feet. Shot on location, by and among members of the expedition team, it's an intimate look at the trials and dangers of the ultimate mountain climbing expedition as the team scales the treacherous North Face. The documentary follows the climbers through most of the trip—the camera walks alongside them during the early phases, and visits with the team members inside their tents at the waystation camps established during the weeks-long ascent. The climbers are frank and honest about their fears and the risks involved, and there's a definite "safety first" tone about the proceedings—a couple of team members are forced to abandon their summit hopes due to bronchitis and retinal hemorrhaging. It's refreshing to learn that these amazing mountaineers are real, surprisingly machismo-free human beings. The film also pays much-deserved attention to the local Sherpa guides and porters who are such an integral part of any Everest expedition. Unfortunately, the up-close tone of Above All Else tends to obscure the scale of the endeavor. We get a few shots of Everest and good looks at the treacherous crevasses and ice blocks the climbers encounter, but it's hard to get a sense of the mountain's immense size, and the filmmakers provide no diagrams or other aids for the audience. There's also remarkably little attention paid to the sheer beauty and grandeur of the Himalayas, and the shot-on-video nature of the production significantly limits its visual quality. While the film captures the human drama of the ascent in an immediate sense, it provides little context to help us appreciate the struggle. Those familiar with Everest will find this an interesting side trip, but it ultimately seems like a "visitor center" film—well-constructed within its narrow focus but not as informative or comprehensive as one might like. Image Transfer Review: Above All Else: The Everest Dream is presented in its original 1.33:1 full-frame aspect ratio. It appears to have been mastered from videotape, with poor vertical resolution (about half of what DVD can deliver) apparent in many scenes; superimposed titles betray scan line artifacts that ought not to be there. There's quite a bit of NTSC chroma noise and some very odd red/blue color fringing in the on-location footage, possibly due to high altitudes and cold temperatures. Unapix's DVD transfer is competent enough, but the source footage doesn't do the majesty of Everest justice. Audio Transfer Review: Above All Else features a bevy of soundtrack formats—Dolby Digital 2.0 Surround, Dolby Digital 5.1, and DTS. Speech recorded on location is understandably a little muddy and clipped, though the post-production narration is clear. Most of the "surround" envelopment is artificial, adding enhanced music and sound effects to the monophonic documentary audio. The DTS track seems more balanced (and louder in general) with greater surround presence; I couldn't detect much of a difference between the Dolby Digital 5.1 and 2.0 tracks aside from stronger bass in the 5.1 mix. It's nice to have the audio options, but this documentary film doesn't cry out for crystalline sound reproduction. 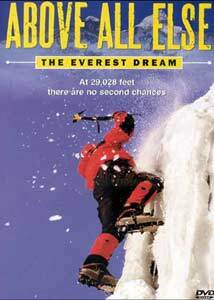 Extras Review: As Above All Else: The Everest Dream is a documentary, the lack of supplemental materials on this DVD isn't surprising. Simple, static picture menus provide access to 8 chapter stops. (Oddly, no "timestamping" is provided on the disc - my listed running time is approximate.) It would have been nice to see some historical Everest footage or other archival materials, but the absence of supplements isn't a major drawback in this case. Above All Else: The Everest Dream provides an up-close look at one team's attempt to scale the highest mountain peak on Earth. The video quality is rather poor, but the surround audio track is effective and Unapix's DVD presents the material adequately. Viewers may want to check out the more substantial Everest: IMAX DVD first, but this is a good companion piece on the subject.